adjective1. attractively unusual or old-fashioned. Though that description applies to the Internet connectivity, as well :-) Truth be told, most hotel WiFi is pretty bad. But nestle a lovely little old hotel on a forgotten little Viking/Celtic island and you will really see the problem exacerbated. I worked around most of my downstream issues with a couple of new extensions to the run-one project, and I'm delighted as always to share these with you in Ubuntu's package! This is a wrapper script that runs no more than one unique instance of some command with a unique set of arguments. This is exactly like run-one, except that it will use pgrep and kill to find and kill any running processes owned by the user and matching the target commands and arguments. Note that run-this-one will block while trying to kill matching processes, until all matching processes are dead. This is often useful when you want to kill any previous copies of the process you want to run (like VPN, SSL, and SSH tunnels). This command operates exactly like run-one except that it respawns the command with its arguments if it exits for any reason (zero or non-zero). This is useful when you want to ensure that you always have a copy of a command or process running, in case it dies or exits for any reason. This is simply an alias for keep-one-running. I've never liked the fact that this command started with "keep-" instead of "run-one-", from a namespace and discoverability perspective. This command operates exactly like run-one-constantly except that it respawns "COMMAND [ARGS]" until COMMAND exits successfully (ie, exits zero). This is useful when downloading something, perhaps using wget --continue or rsync, over a crappy quaint hotel WiFi connection. This command operates exactly like run-one-constantly except that it respawns "COMMAND [ARGS]" until COMMAND exits with failure (ie, exits non-zero). This is useful when you want to run something until something goes wrong. 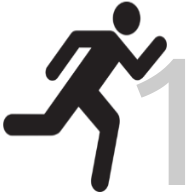 First, the "one" part of run-one-constantly is important, in that it uses run-one to protect you from running more than one instances of the specified command. This is handy for something like an ssh tunnel, that you only really want/need one of. Second, nohup doesn't rerun the specified command if it exits cleanly, or forcibly gets killed. nohup only ignores the hangup signal. So you might say that the run-one tools are a bit more resilient than nohup. Upstart is Ubuntu's event driven replacement for sysvinit. It's typically used to start daemons and other scripts, utilities, and "jobs" at boot time. It has a really cool feature/command/option called respawn, which can be used to provide a very similar effect as run-one-constantly. In fact, I've used respawn in several of the upstart jobs I've written for the Ubuntu server, so I'm happy to credit upstart's respawn for the idea. That said, I think the differences between upstart and run-one are certainly different enough to merit both tools, at least on my servers. An upstart job is defined by its own script-like syntax. You can see many examples in Ubuntu's /etc/init/*.conf. On my system the average upstart job is 25 lines long. The run-one commands are simply prepended onto the beginning of any command line program and arguments you want to run. You can certainly use run-one and friends inside of a script, but they're typically used in an interactive shell command line. An upstart job typically runs at boot time, or when "started" using the start command, and these start jobs located in the root-writable /etc/init/. Can a non-root user write their own upstart job, and start and stop it? Not that I can tell (and I'm happy to be corrected here)... Turns out I was wrong about that, per a set of recently added features to Upstart (thanks, James, and Stuart for pointing out! ), non-root users can now write and run their own upstart jobs.. Still, any user on the system can launch run-one jobs, and their own command+arguments namespace is unique to them. run-one is easily usable on systems that do not have upstart available; the only hard dependency is on the flock(1) utility.